AMERICA did as much as any country to create post-war Europe. In the late 1940s and the 1950s it was midwife to the treaty that became the European Union and to NATO, the military alliance that won the cold war. The United States acted partly out of charity, but chiefly out of self-interest. Having been dragged into two world wars, it wanted to banish Franco-German rivalry and build a rampart against the Soviet threat. After the Soviet collapse in 1991, the alliance anchored democracy in the newly liberated states of eastern Europe. 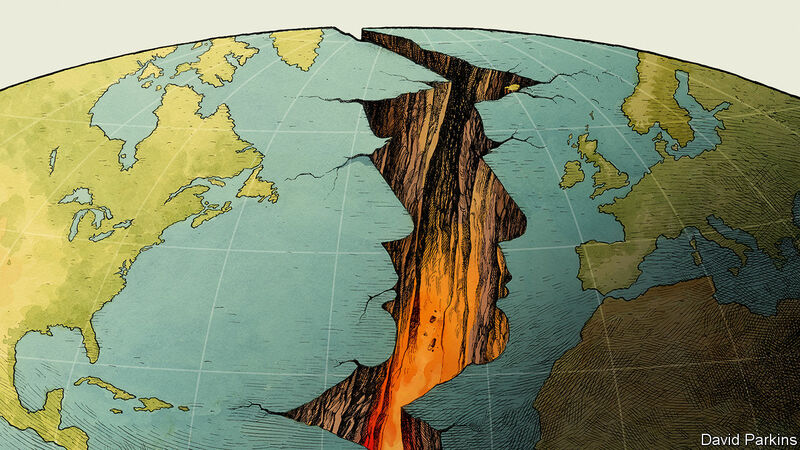 Today, however, America and Europe are separated by a growing rift. The mood before the NATO summit in Brussels on July 11th and 12th is poisonous. As President Donald Trump accuses the Europeans of bad faith and of failing to pull their weight, they accuse him of crass vandalism. A second summit, between Vladimir Putin and Mr Trump in Helsinki on July 16th, could produce the once-unthinkable spectacle of an American president treating his Russian opponent better than he has just treated his allies. Even if the two summits pass off without controversy—as they might, given how Mr Trump delights in confounding his critics—the differing priorities, divergent beliefs and clashing political cultures will remain. The Western alliance is in trouble, and that should worry Europe, America and the world. Every alliance has its tensions, but the Western one is strained on a bewildering number of fronts. Mr Trump, and his generals, are exasperated by the feeble efforts of many NATO members to honour their promise to raise defence spending towards 2% of GDP by 2024. The American right tends to condemn European support for the Iranian nuclear deal (which Mr Trump quit), and what it sees as a bias against Israel. And policymakers from both parties think that, as the world’s attention shifts to Asia, whining, sanctimonious Europeans deserve less of their time. As if that were not enough, Mr Trump fatuously accuses the EU of being “set up to take advantage of the United States” and chastises it for unfair trade. Meanwhile, Europe is divided. Italy has a new populist coalition that is pro-Putin. So, increasingly, is Turkey, a member of NATO (but not the EU) which is hostile to the liberal democratic values that bind the alliance. Worse could be in store. A Labour government in Britain under Jeremy Corbyn, who has a long history of opposing the use of arms by the West, would treat America with deep suspicion; he could even try to leave NATO. This newspaper believes that the Western alliance is worth saving. In a dangerous and increasingly authoritarian world, it can act as a vital source of security and a bastion of democracy. But the alliance does not have a God-given right to survive. It must continually earn its place. The question is: how? The first step is not to make the job harder. Europe should do everything it can to resist Mr Trump’s instinct to lump trade with security. Wrapping them up together will only make the West less secure as well as poorer. Next, supporters of the alliance need to be practical. That means paying up. Mr Trump is right to complain about countries like Germany and Italy, which spent just 1.22% and 1.13% of GDP on defence in 2017. Indeed, he could go further. Too little of defence spending is useful—over a third of Belgium’s is eaten up by pensions. More should go on R&D and equipment. For America’s allies, being practical also means keeping up. Collaboration in areas like cyber-security will make the alliance more valuable to America. More urgently NATO must continue to sharpen its response to the tactics of misinformation and infiltration that Russia used in Crimea and eastern Ukraine. Politics waxes and wanes. Lost military understanding is hard to rebuild. Exercises that cement NATO’s remarkably close working military relations are more vital than ever. And being practical means sticking together. Negotiating over Brexit, the EU is minded to shut Britain out of the union’s security structures because it will no longer be a member. Given Britain’s military experience, its arms industry and its intelligence agencies, that is self-defeating. Instead, the EU’s members should seek to bind Britain in by, for example, promoting the European Intervention Initiative, proposed by France, which aims to create a force that can act in crises. Once America would have seen such a plan as a threat to NATO. Today it would stand both as insurance and as a sign that Europe is willing to take on more responsibility. Last is the battle of ideas. If NATO and the EU did not already exist, they would not be created. Since the Soviet collapse, the sense of threat has receded and the barriers to working together have risen. Yet that does not make the transatlantic alliance “obsolete”, as Mr Trump once claimed. America’s alliances are an asset that are the envy of Russia and China. NATO is an inheritance that is all the more precious for being irreplaceable. The need for security remains. Russia is not the Soviet Union but, as a declining power, it feels threatened. It has modernised its forces and is prepared to deploy them. The need to anchor European democracy remains, too. As authoritarianism creeps up on Poland and Hungary, the EU and NATO can once again help limit its advance. And there is the extra benefit of how Europe helps America project power, by providing bases, troops and, usually, diplomatic support. NATO is more fragile than Mr Trump thinks. At its core is the pledge to treat an attack on one member in the North Atlantic region as an attack on them all. His vacillation and his hostility to Europe weakens that promise, if only because it reveals his scorn for the idea that small countries have the same rights as big ones. Asia is watching, as is Mr Putin. The more Mr Trump bullies his allies, the more the world will doubt America’s security guarantees. Because great powers compete in a grey zone between peace and war, that risks miscalculation. Mr Trump believes he is a master negotiator in pursuit of a stronger America. With Europe, as with so much else, he gravely undervalues what he is giving up. NEW HAVEN – With each passing day, it becomes increasingly evident that US President Donald Trump’s administration cares less about economics and more about the aggressive exercise of political power. This is obviously a source of enormous frustration for those of us who practice the art and science of economics. But by now, the verdict is self-evident: Trump and his team continue to flaunt virtually every principle of conventional economics. Trade policy is an obvious and essential case in point. Showing no appreciation of the time-honored linkage between trade deficits and macroeconomic saving-investment imbalances, the president continues to fixate on bilateral solutions to a multilateral problem – in effect, blaming China for America’s merchandise trade deficits with 102 countries. Similarly, his refusal to sign the recent G7 communiqué was couched in the claim that the US is like a “piggy bank that everybody is robbing” through unfair trading practices. But piggy banks are for saving, and in the first quarter of this year, America’s net domestic saving rate was just 1.5% of national income. Not much to rob there! The same can be said of fiscal policy. Trump’s deficit-busting tax cuts and increases in government spending make no sense for an economy nearing a business-cycle peak and with an unemployment rate of 3.8%. Moreover, the feedback loop through the saving channel only exacerbates the very trade problems that Trump claims to be solving. With the Congressional Budget Office projecting that federal budget deficits will average 4.2% of GDP from now until 2023, domestic saving will come under further pressure, fueling increased demand for surplus saving from abroad and even bigger trade deficits in order to fill the void. Yet Trump now ups the ante on tariffs – in effect, biting the very hand that feeds the US economy. So what Trump is doing is not about economics – or at least not about economics as most academics, political leaders, and citizens know it. Sure, Trump has been quick to draw on some fringe mutations of economics – say, Arthur Laffer’s infamous back-of-a-napkin supply-side musings – but none that have withstood the test of time and rigorous empirical validation. But why single out economics? The same complaint could be made about Trump’s views on climate change, immigration, foreign policy, or even gun control. It’s power politics over fact-based policymaking. This should not be all that surprising. Trump’s battle with China merely underscores his eagerness – transparent from the start – to use economics as a foil in his pitch to “Make America Great Again.” Contrary to his bluster over unfair trade deficits, China’s real challenge to the United States is less about economics and more about the race for technological and military supremacy. Indeed, the pendulum of geopolitical leadership is now in motion. China’s massive pan-Asian infrastructure plan, the Belt and Road Initiative, together with its muscular behavior in the South China Sea, pose far greater threats to American hegemony than does one bilateral piece of a much larger multilateral trade deficit. At the same time, China’s recent efforts to build the institutions of an alternative financial architecture – spearheaded by the Asian Infrastructure Investment Bank and the New (BRICS) Development Bank – stand in sharp contrast to an increasingly inward-looking US. Much has been written about the historical trajectory of great powers and the military conflicts that often arise during their rise and fall. This is where economics eventually comes back into play. Geostrategic power and economic power are joined at the hip. As Yale historian Paul Kennedy has long stressed, a condition of “imperial overreach” arises when the projection of military power outstrips a country’s shaky economic foundations. It has been 30 years since Kennedy warned that the US, with its excessive defense spending, was increasingly vulnerable to such overreach. But then the would-be heirs to the US faded: The Soviet Union collapsed, Japan’s economic miracle imploded, and Germany became entangled in reunification and European integration. An unthreatened America plodded on. China, of course, was barely on the radar screen back then. Moreover, in 1988 the US had a net domestic saving rate of 5.6% of national income – only slightly below the 6.3% average of the final three decades of the twentieth century, but nearly four times the current rate. Back then, the US was spending $270 billion on defense – less than half the $700 billion authorized in the current budget, which now outstrips the combined military outlays of China, Russia, the United Kingdom, India, France, Japan, Saudi Arabia, and Germany. Meanwhile China has ascended. Back in 1988, its per capita GDP was just 4% of the US level (in purchasing-power-parity terms). This year, that ratio is close to 30% – nearly an eightfold increase in just three decades. Can power politics offset the increasingly tenuous fundamentals of a saving-short US economy that continues to account for a disproportionate share of global military spending? Can power politics contain the rise of China and neutralize its commitment to pan-regional integration and globalization? The Trump administration seems to believe that America has reached a propitious moment in the economic cycle to play the power game. Yet its strategy will succeed only if China capitulates on the core principles of the growth strategy that frames President Xi Jinping’s great power aspirations: indigenous innovation, technological and military supremacy, and pan-regional leadership. Like Trump, Xi does not do capitulation. Unlike Trump, Xi understands the linkage between economic and geostrategic power. Trump claims that trade wars are easy to win. Not only is he at risk of underestimating his adversary, but he may be even more at risk of over-estimating America’s strength. The trade war may well be an early skirmish in a much tougher battle, during which economics will ultimately trump Trump. Stephen S. Roach, former Chairman of Morgan Stanley Asia and the firm's chief economist, is a senior fellow at Yale University's Jackson Institute of Global Affairs and a senior lecturer at Yale's School of Management. He is the author of Unbalanced: The Codependency of America and China. An international nationalist movement sounds like a contradiction. Nationalists are concerned above all by the fortunes of their own tribe. International co-operation does not come naturally to them. And yet, despite this, the world is seeing the emergence of a “nationalist international”. Nationalist political parties are on the rise across the west — and they are taking inspiration from each other and working together. Donald Trump is central to this development. The US president is often portrayed as an isolated maverick on the world stage. But, in fact, he is emerging as the informal leader of an international movement. By shifting American politics in a more nationalist direction, Mr Trump has changed the tone of politics everywhere. The US president already has ideological soulmates in Europe, where the key figures include Viktor Orban, the prime minister of Hungary (who came to power before Mr Trump), and Matteo Salvini, Italy’s deputy prime minister. Europe’s nationalists include far-right parties that are now in coalition governments, such as Mr Salvini’s League and Austria’s Freedom Party. But nationalist themes have also been increasingly adopted by more traditional centre-right parties, such as Germany’s CSU, Britain’s Conservatives and Austria’s People’s party. The nationalists’ dominant issue is usually immigration — and the need to defend the nation against “swarms” of migrants from outside the west. When it comes to economics, they are often drawn to Trump-style protectionism. These nationalists are also hostile to international institutions and treaties, which they regard as the playthings of a rootless, global elite. The Trump administration has withdrawn from international treaties such as the Paris climate accord, and organisations like the UN Human Rights Council. The European nationalists focus their ire on the EU and the international rules governing the treatment of refugees. The nationalists are often fans of Vladimir Putin. The Russian president is admired as a tough guy who sticks up for his nation. His violation of international laws in the process is regarded as a plus — not a minus. By contrast, the nationalists detest Angela Merkel, the German chancellor, and Justin Trudeau, the Canadian prime minister, who are seen as preachy internationalists, hopelessly soft-headed on the defining issue of immigration. Many liberal internationalists find it hard to accept that the nationalists are making progress partly because they have some genuine political insights. Their emphasis on the enduring importance of the nation-state clearly resonates with voters. Demands for tougher control of illegal migration flow naturally from that idea — since the question of who is entitled to citizenship is central to national identity. Europe’s nationalists, such as Mr Salvini, Mr Orban and Britain’s Nigel Farage, have capitalised on complaints that the EU grabbed too many of the traditional powers of the nation and controls everything from national budget deficits to citizenship rights. The central demands of the new nationalists, such as control of immigration or protectionism, have a legitimate place in democratic politics. But the policies adopted by them, once they are in power, have quickly spun off into horrifying directions, such as the detention of migrant children in the US or Mr Salvini’s demand for a mass expulsion of the Roma population from Italy. One key problem is that the nationalist emphasis on the nation-state usually has a strong cultural and racial element. Once you start thinking of outsiders as less worthy than your compatriots — indeed, as people who “infest” your nation (in the words of President Trump) — than it becomes much easier to treat them brutally. A second problem is that the new nationalists often ignore the complexity of the modern world. International rules are not simply the product of the ideological preferences of an unmoored globalist elite. They are the necessary means to regulate the interactions of nations on everything from trade to travel. Abolish all those fussy international laws and you are on the route to anarchy, a trade war — or a real war. So while the nationalists are making common cause in taking on their liberal internationalist foes around the world, the “nationalist international” is intrinsically unstable. A world in which nation-states see each other above all as rivals is one that is primed for conflict. The liquidation of a $1bn bet placed by a mysterious Chinese investor has roiled the copper market, triggering a violent sell off that has seen the metal plunge to a 12-month low. Data released by the Shanghai Futures Exchange showed the huge futures position held at Gelin Dahua, a Beijing-based brokerage, has fallen from a net long of 36,050 lots last Wednesday to just around 10,000 lots today. That is the equivalent of 80,000 tonnes of copper worth roughly $800m that has been dumped on the market in the past few trading sessions in China, placing huge pressure on the global copper price. Since August last year, Gelin has been the dominant buyer of copper, stepping into the market whenever the metal weakened, according Nicholas Snowdon, analyst at Deutsche Bank. The position is rumoured to be owned by a coal investor in Shanxi, the location of Beijing-based Gelin Dahua’s parent company, Shanxi Securities. But positions on the Shanghai Futures Exchange are only divided by securities companies, not by individuals. It is not clear why Gelin has started to liquidate the position but local media said it was either a strategic retreat or forced selling. The price of the copper has been under pressure since of the start June on fears about a trade war between China and the US could economic growth. The metal, used in everything from washing machines to cars, has fallen 14 per cent from the four-and-half year high of $7,348 a tonne. If Gelin keeps selling — and traders reckon its position is now underwater — the price of copper could fall to $6,000 a tonne. But if it decides to retain a position, copper could bounce back. “Whilst sentiment has deteriorated on the trade war escalation, the reality is the outlook for the copper market has not materially changed and if anything, the move lower in price will only serve to tighten market conditions as scrap supply will dry up in third quarter on the price move lower and tensions in mine labour negotiations rise as miners generosity rescinds with the copper price,” said Mr Snowdon. Talks over a new wage deal at Escondida, the world’s biggest copper mine, are still far from being concluded with just left weeks left to conclude negotiations. Failure to reach an agreement last year led to 44-day strike. Copper for delivery in three months on the London Metal Exchange — the global benchmark — rose $69.50 to $6,378. The Kremlin is up to its old tricks in Daniel Ortega’s corrupt Nicaragua. Sometimes it seems that Central America is unwilling or unable to make the connection between strong institutions and a free and just society. The privation in the northern triangle—Guatemala, Honduras and El Salvador—that has sent thousands of migrants to the U.S. border in search of work and a better life is ultimately the result of failed institutions. The bloody upheaval in Nicaragua is another case in point. 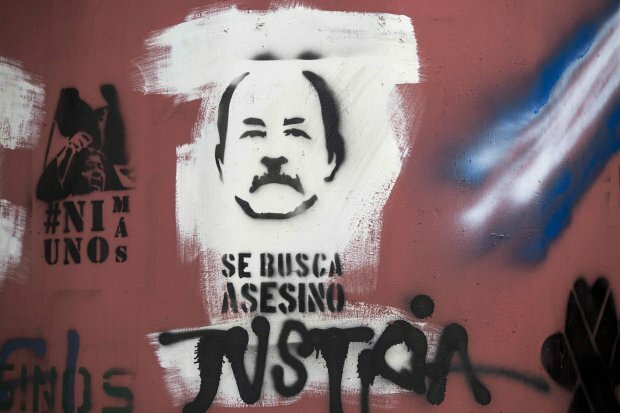 Since April 19 more than 300 people have been killed while protesting against strongman Daniel Ortega, according to local human-rights groups. The U.S. Treasury last week imposed sanctions on three Ortega henchmen—the national police commissioner and a Sandinista Youth official for human-rights violations, and the head of Nicaragua’s state-owned oil company for corruption. Central America is strategically important to enemies of the U.S., and Russia’s role is particularly notable. It has a large and secretive satellite compound at the edge of the Nejapa lagoon on the outskirts of Managua, and its Interior Ministry has a large “police training center” in the capital’s Las Colinas neighborhood. The Soviet Union was an Ortega ally in the 1980s, and Russia today has every incentive to help him prosper as a dictator. Nicaragua hasn’t had a fair, transparent national vote since the one that brought Mr. Ortega to power in 2006. He and his unpopular wife Rosario Murillo, now Nicaragua’s richest couple, are often called “the new Somozas,” a reference to the ruling family Mr. Ortega’s Sandinista movement removed in 1979. When it’s all over except for carting away the dead, as in Venezuela, U.S. diplomats and legislators are good at tsk-tsking abuses of power. But when something can still be done about it, they are mostly AWOL and sometimes complicit. Witness U.S. funding of the U.N.’s International Commission against Impunity in Guatemala, or CICIG. CICIG’s abuse of a Russian migrant family, which I have written about several times, is one example of how the commission egregiously tramples rights. But CICIG’s perniciousness goes much deeper. Claims that it has morphed into a tool of power-hungry political and economic interests are credible. By weakening already weak institutions, it threatens Guatemala’s democracy. Well-known organized-crime groups, like one famous for blatantly stealing electricity to fund its militant, left-wing activism, remain untouched by CICIG. Meanwhile the commission uses its unchecked power to go after center-right business interests that have traditionally backed democratic capitalism. Lead CICIG prosecutor Iván Velásquez has made no secret of his desire to bring down democratically elected center-right President Jimmy Morales. Nicaragua ought to be a lesson for Guatemalans and the U.S. The checks and balances to contain Mr. Ortega were in place a decade ago. But he gradually eroded them, and his power grab was permitted and even celebrated at home and abroad. He was said to be helping the poor while he shared the spoils of his power grab with the business community. He has also made Russia feel at home. It all began when he made a deal with the corrupt former center-right President Arnoldo Alemán to lower the minimum vote threshold necessary to win a presidential election in the first round to 35%. He won in 2006 with 38%. Venezuelan oil largess boosted his might from the start. He controlled the army and he had a sizable representation of Sandinista judges on the Supreme Court. Mr. Ortega’s creeping authoritarianism was clear as early as February 2010. He continued dismantling limits on his personal power with little push-back. By 2011 he was running for re-election in defiance of the constitution. Only when Venezuelan oil dried up in 2016 did things begin to get difficult for him. A slowing economy has made the Somoza-like Ortega dynasty more objectionable. University students are angry about government hints of new social-media restrictions and about a huge fire in an important biological reserve in April. The tipping point was when retirees, demonstrating on April 18 against a social-security reform decreed by Mr. Ortega, were roughed up by thugs while police watched. Student protests began the next day. Meanwhile Mr. Ortega has lost the support of his business allies. They were already miffed about Ms. Murillo’s increasing power and her heavy-handed style. Not consulting them about the pension reform was a step too far. Citizens are being indiscriminately gunned down by Ortega police and trained paramilitaries. At a Mother’s Day march May 30, called to show solidarity with victims’ families, 15 people were killed by snipers using Russian Dragunov rifles. Russia knows how to put down rebellions. The Soviets did it in Cuba in the 1960s for Fidel Castro by quashing the uprising in the Escambray mountains. The Nicaraguan city of Masaya was an opposition stronghold until Mr. Ortega called in police reinforcements from Managua on June 19 and took it back. Without greater international help, that may go down as the turning point in this struggle. Good news for the Kremlin, but heartbreaking for Nicaraguans. Protests in the capital are growing. Things in Iran seem to be going from bad to worse. Protests have broken out again, this time centered in the capital, Tehran, as the Iranian currency plummets in value. Thousands of people, including traders in Tehran’s Grand Bazaar, participated in the protests, which started June 24. According to the BBC, they are the largest protests in the country since 2012, when economic sanctions degraded the economy and galvanized the public to action. The Iranian economy, however, rebounded after the nuclear agreement in 2015 lifted the sanctions, and Iran re-entered the global economy. The U.S. withdrawal from the deal, and fears that it will lead to a total collapse of the agreement, is at least partly responsible for the rial’s decline. The rial is currently worth 90,000 rials to the dollar, a sharp fall from roughly 43,000 to the dollar at the end of 2017. And its decline has had a real impact on businesses that rely on imports, which become more expensive when a currency depreciates. It’s not clear who organized the protests, but Iranian media reported that the demonstrations that shut down the Grand Bazaar started when the rial fell to 90,000 to the dollar. The government tried to address the currency problem in April, when it fixed the official exchange rate at 42,000 rials to the dollar. But this rate hasn’t held on the black market. Large, anti-government protests also erupted in late December and early January. Those protests, initially sparked by rising food prices, spread to cities and villages across the country, while the current demonstrations are focused in the capital. The Rouhani government, which thought that the nuclear deal would generate more widespread economic benefits than it actually has, is under pressure from hardliners, who were happy to see it fail Indeed, it’s not just opposition or international media reporting on the protests this time around, as so often happens in Iran. Mainstream Iranian media outlets have also been reporting on them, indicating that a segment of the establishment wants them to be publicized. Security forces appear to have control of the unrest for now, but there’s no telling if the peace will keep, considering that sanctions are looming and there’s no end in sight for the rial’s decline. Is China Part Of The “Emerging Market Crisis”? Being huge, consequential and technologically advanced, China isn’t normally lumped into the “emerging” category with Brazil and Argentina. To most observers they’ve already left the kids table and are now seated with the developed-world adults. But that might be premature. A big part of China’s economic ascendance was purchased with borrowed money – including a lot of US dollars – and came at the perceived expense of US well-being. And the US now wants to redress what it sees as unfair terms of trade in the most abrupt way possible. Has the Big Yuan Short Finally Arrived? Chinese markets are in trouble once again. China’s currency is down nearly 1% from Friday’s close, wiping out the yuan’s gains for the year, after the People’s Bank of China cut reserve requirements for banks over the weekend. Slowing growth and rising trade tensions are pummeling Chinese shares, with the Shanghai Composite entering a bear market Tuesday. And rising defaults are testing the country’s gargantuan debt market. To investors with a long memory, this may sound uncomfortably familiar. The last big yuan selloff, beginning in mid-2015, was heralded by a historic stock-market collapse, a rash of corporate bond defaults and Chinese monetary easing. As in 2015, the U.S. and Chinese central banks are moving in opposite directions, making yuan assets less attractive. Investors owning Chinese rather than U.S. 10-year government bonds pocketed a measly 0.6 percentage-point yield premium in May, the smallest since late 2016. China is now gradually easing monetary policy, while the Federal Reserve is tightening. Trade tensions are rising, and China posted its first current-account deficit since 2001 in the first quarter. Growth will probably slow further in the second half. Panic or no panic, a weaker Chinese currency in the months ahead still seems likely. China’s currency has slipped markedly in the last week, to the point where it’s trading at December lows against the dollar, and that’s prompting speculation that China would be willing to use a weakened currency to fight U.S. tariffs and trade threats. China has often been accused by the U.S. government of intentionally keeping its currency depressed to cheapen its goods in the world market, making them more attractive than those from countries with stronger currencies. 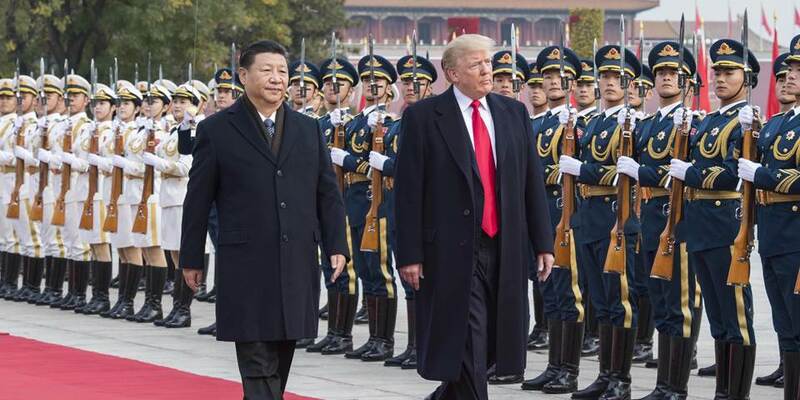 The Trump administration this year stopped short of calling China a ‘currency manipulator,’ and China’s currency has actually been fairly steady for most of the year. Nonetheless, rumors circulated that China could go further and actually become aggressive in forcing a decline in the remnimbi, also known as the yuan. “The yuan is controlled. They allow it to trade in a band. In order to make sure they don’t have a runaway trade. What you’re seeing is the [speculators] took it by the upper limit of its band,” said Boris Schlossberg, managing director at BK Asset Management. But there’s another side – the emerging market side – to a Chinese devaluation: All those dollars that Chinese companies and local governments have borrowed would – with a rising dollar – become a lot harder to pay off. The following chart illustrates the magnitude of China’s dollar obligations relative to other emerging countries. $100 billion isn’t unmanageable for a several-trillion-dollar economy, but it’s definitely a problem in a world of many other problems. To sum up, a Chinese devaluation helps with trade but hurts with debt repayment. And it’s not clear which side of that equation outweighs the other – or whether this kind of currency war escalation might get out of hand.